28% of companies are already seeing value from IX Programs. While some companies are achieving success, why do others seem slow to capture comparable results? 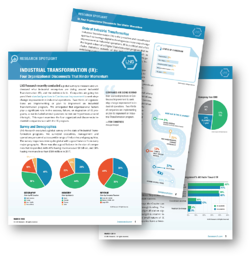 Industrial organizations all over the globe are planning and executing Industrial Transformation (IX) Programs to deliver a step-change improvement in their operations. However, LNS’ recent global survey results show that most companies are NOT organizing for success. This Research Spotlight drills into four “disconnects” organizations commonly face on their journey to IX success.